The green room – inside the tube - is the ultimate destination for every surfer. Lost in liquid, it’s a place where time travel seems possible, sliding in surreal slow motion. But despite our quest to find the green room, surfers are about as environmentally green as a Texan oil garden. We paddle out in our PVC-colour-coordinated-petrochemical-outfit and claim to be clean living, but the truth is rather different: surfers worldwide consume three quarters of a million toxic, non-sustainable surfboards per year. Anybody wishing to see how four of the world’s best professional surfers – fresh from 10-ft Hawaiian breaks – adjust to British conditions should get themselves to Porthcawl, Wales this weekend. The “Santa Cruz Shootout” will see Matt Archbold, Shaun “Barney” Barron, Matt “Rat” Schrodetz, and Ford Archbold take to the waves at Rest Bay, Porthcawl on Saturday, in a contest whose winner will secure a trip to Hawaii. The Fat Face Night Surf proved, again, that good surfers know what they’re doing in the dark. After a scorching day at Lusty Glaze, the sun set on contestable two-foot surf which gained a modest boost on the push. By high tide, spectators lined the surrounding cliffs and packed the beach to watch some of the best surfers from the UK and Ireland do battle for points in what was the third leg of the British Professional Surfing Association 2006 Tour. Illuminated by floodlights, the action had a surreal quality, but there was nothing less than tangible in the performance of Newquay local Alan Stokes. 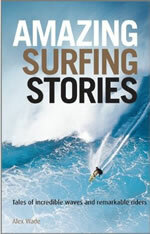 There are many books on surfing, but few can be classed as literary. Writers such as Tom Wolfe and Jack London showed a fascination, if not an absorption, with surfing, and some 20 years ago Cambridge don Andy Martin crafted Walking on Water, a witty account of his efforts to learn to surf in France and Hawaii. More recently Australian writer and surfer Fiona Capp published That Oceanic Feeling, a beautiful narrative capturing the longing for the sea within many of us. American novelist Kem Nunn’s The Dogs of Winter, published in 1997, is one of the few other books tackling surfing that merits the “literary” tag. That could be about to change with the publication at the beginning of June of Welsh surfer Tom Anderson’s Riding the Magic Carpet. I’m two-thirds through Anderson’s odyssey to surf the perfect rights of South Africa’s Jeffrey’s Bay, and it’s looking good. Review to follow soon. This month sees the arrival of the latest surf mag to hit the UK streets. Huck, edited by Vince Medeiros (who, in an earlier incarnation, was at the helm of America’s Surfing magazine) has gone on sale with some style. Medeiros finds time to pen an intriguing piece entitled “Surfing is a fiction,” in which he quotes French post-structuralist Jacques Lacan and his belief that “there is no subject independent of language,” before going on to assess how, in Lacanian terms, we define and explain the act of surfing. Pretentious, Huck? No – because Medeiros writes elegantly and incisively enough get away with being probably the first surf mag editor to co-opt the famous Frenchman in this way. You can do a lot worse in life than head to Watergate Bay, on Cornwall’s north coast. For many years, Watergate had a slightly dilapidated air – more underdeveloped British seaside village than surfing hotspot – but all that has changed, thanks to the Ashworth brothers, Will and Henry, and the energy with which they have gone about transforming the place. Surfing is not just about surfers. Windsurfers, kitesurfers, bodyboarders and waveski riders also know the thrill of riding waves. So, too, do the ultra-fit crews of surfboats, long, angular craft powered by teams of four oarsmen. The received wisdom is that surfing is the most difficult of all wave-related sports, but mastering a surfboat runs it a close second. Surfing at night? Madness, surely. The surfers won’t be able to see each other, let alone whether there are any decent waves heading their way. Well, usually, yes. But this weekend sees the Fat Face Night Surf at Lusty Glaze beach, Newquay, an event now so firmly etched on the British surfing calendar that it cannot be dismissed as typical native eccentricity. How many surfers does it take to ride a wave? The answer is 44 – if you’re looking to set a world record. The record for the most surfers to ride a wave simultaneously was set just over two weeks ago, not in Hawaii, not in California, not in South Africa, nor even in Australia, but in the Atlantic sea of a small town in the west of Ireland. Summer is here. You can tell because the roads of Devon and Cornwall were last week packed with surfboards (on the roof-racks of cars, that is). Half-term gave its usual preview of the annual July and August deluge, when everyone in Britain, it seems, heads to the south-west to go surfing. It’ll be marginally quieter for a few weeks, and then, bang: by mid-July the average journey time for locals living near the coast in the south-west will increase by four hours.